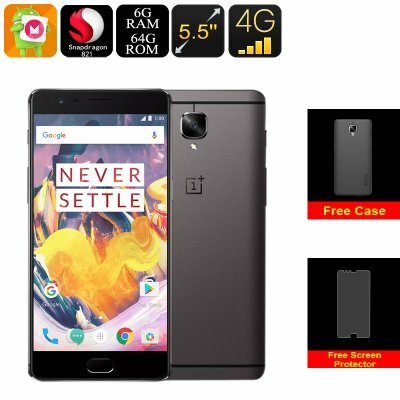 Successfully Added OnePlus 3T Android Smartphone - Android 6.0, 5.5-Inch Gorilla Glass, Quad-Core CPU, 6GB RAM, 16MP Camera, 4G to your Shopping Cart. What truly sets this remarkable Android phone apart from other Chinese smartphones is that it holds two; yes you read it correctly, two stunning 16MP cameras. At the rear, this Android smartphone features a beautiful 16MP Samsung camera that allows you to snap breathtaking pictures of all your upcoming adventures. Additionally, it also allows you to shoot video in ultra-HD 4K resolution, letting you capture all those special memories in absolutely stunning beauty. Added to that comes the phone’s 16MP Sony camera. This front snapper is a dream to all selfie lovers out there as it allows you to snap pictures of you and your friends in mesmerizing quality. Additionally, it lets you engage in FHD online video calls, allowing you to stay in contact with all your loved ones at any time of the day. Packing a Qualcomm Snapdragon 821 CPU, the OnePlus 3T Android phone lets you enjoy the most demanding games and applications without dropping a frame. Built for speed, this Quad-Core CPU that has been clocked at 2.35GHz handles whatever you throw at it without you ever needing to worry about slowing down your device. Additionally, this Chinese Android phone packs a whopping 6GB of RAM, allowing it to handle the most demanding of multitasking sessions out there at ease. Thanks to its epic 3400mAh battery, the OnePlus 3T Gunmetal lets you enjoy all this flagship smartphone has to offer for numerous hours continuously, allowing you to get through the longest of days without needing to worry about battery life. By supporting both 4G connectivity and Dual-Band Wi-Fi, you’ll be able to enjoy the fastest data speeds out there no matter where you’re located. Whether you’re at home, in the office, or out in the city – with this Chinese smartphone you’ll always be able to browse the web, play games, or stream online movies in the blink of an eye. Head out to the Play Store and download one of the millions free applications, games or movies at lightning speeds– with the OnePlus 3T Gunmetal Android smartphone countless hours of mobile fun and entertainment lay ahead that can now be enjoyed at any time of the day no matter where you’re at. The OnePlus 3T comes with a 12 months warranty, brought to you by the leader in Chinese smartphones as well as wholesale electronic gadgets..
i received the item and shipping is really fast. I am delighted after checking the product, its superb. giving above all 5 star, i want to thank all the staff of chinavasion for the great job.